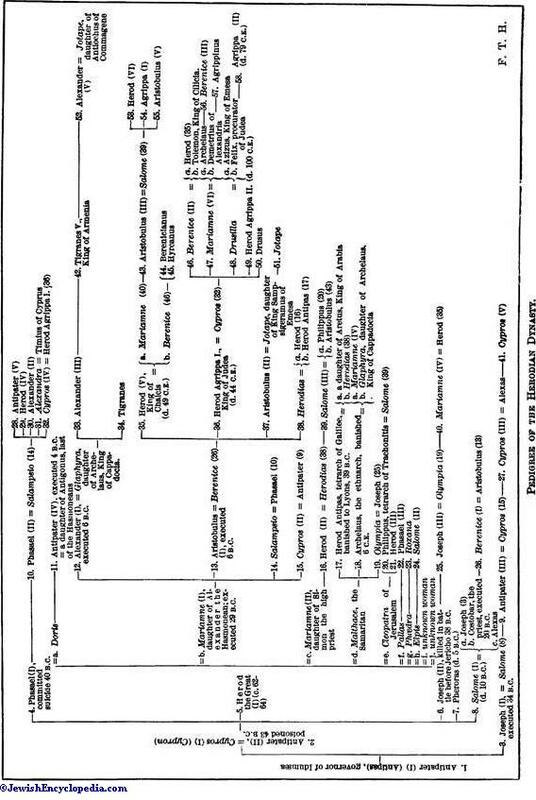 Pedigree of the Herodian Dynasty. 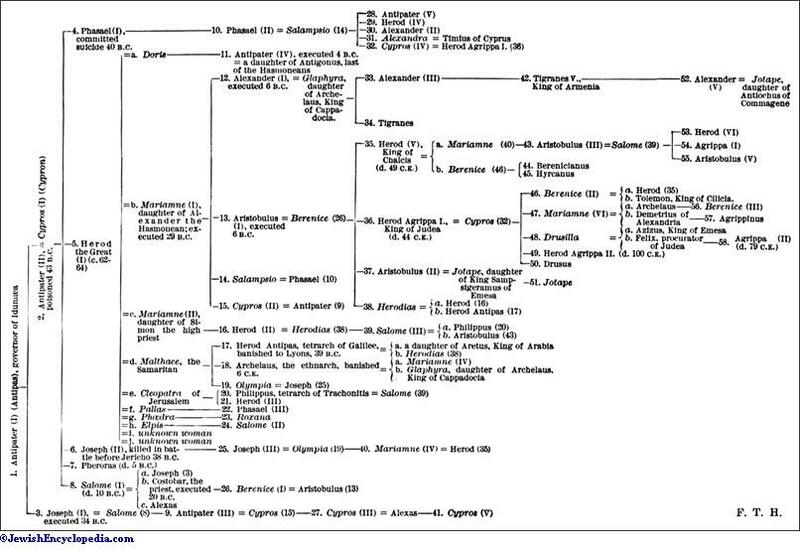 Daughter of Aristobulus and Berenice and granddaughter of Herod I. and of his sister Salome. She was first married to her uncle Herod (not Philip, as in Mark vi. 17; see Schürer, "Gesch." i. 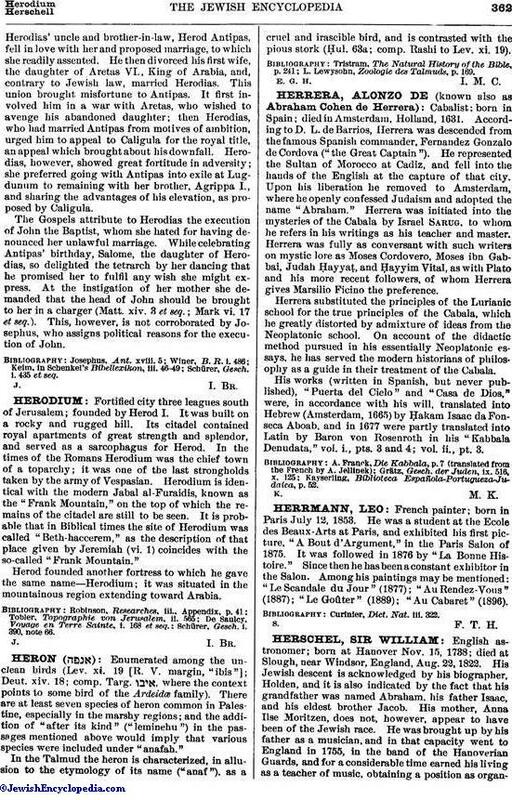 435, note 19), son of Herod I. by the second Mariamne, with whom she lived in Rome upon the revenues assigned to them by Herod I. and Salome. From this union issued Salome, the wife of the tetrarch Herod Philip. 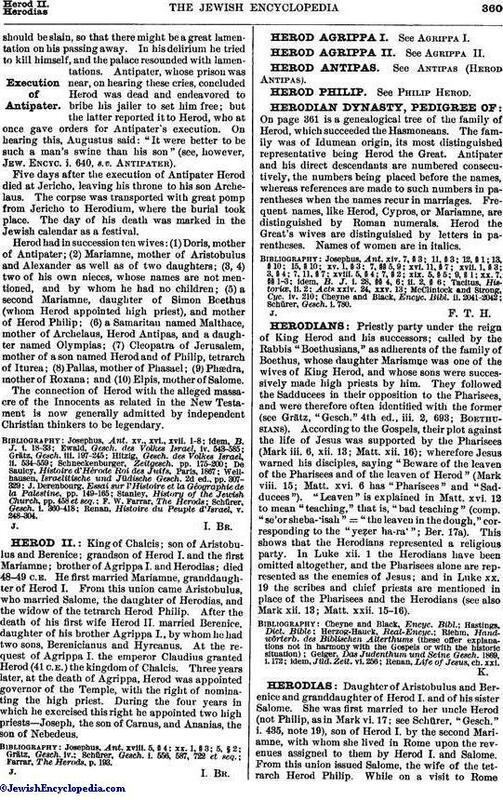 While on a visit to Rome Herodias' uncle and brother-in-law, Herod Antipas, fell in love with her and proposed marriage, to which she readily assented. He then divorced his first wife, the daughter of Aretas VI., King of Arabia, and, contrary to Jewish law, married Herodias. This union brought misfortune to Antipas. It first involved him in a war with Aretas, who wished to avenge his abandoned daughter; then Herodias, who had married Antipas from motives of ambition, urged him to appeal to Caligula for the royal title, an appeal which brought about his downfall. Herodias, however, showed great fortitude in adversity; she preferred going with Antipas into exile at Lugdunum to remaining with her brother, Agrippa I., and sharing the advantages of his elevation, as proposed by Caligula. The Gospels attribute to Herodias the execution of John the Baptist, whom she hated for having denounced her unlawful marriage. While celebrating Antipas' birthday, Salome, the daughter of Herodias, so delighted the tetrarch by her dancing that he promised her to fulfil any wish she might express. At the instigation of her mother she demanded that the head of John should be brought to her in a charger (Matt. xiv. 3 et seq. ; Mark vi. 17 et seq.). This, however, is not corroborated by Josephus, who assigns political reasons for the execution of John. Schürer, Gesch. i. 435 et seq.